Increasing your intake of leafy greens can be difficult with a busy schedule, but juicing provides a power-packed and efficient solution, especially with the best masticating juicer for leafy greens of 2019. The idea of juicing is a no brainer, but once people exploring juice machine options, things can get a little overwhelming. This is why some people end up quitting before they start and opting for more expensive ready to drink green juices from their local market. However, once you understand what’s involved in the juicing process it becomes much more realistic to do at home. The end result is a massive increase in nutrient delivery to you and your family and an overall savings compared to buying ready made fruit and vegetable juices. To keep it simple, we’ve researched and juiced up the most nutrient-rich information on the top-rated masticating veggie and fruit juicers, as well as the worst one you should avoid. What is the main difference in quality between masticating and electric juicers for leafy greens, veggies, and fruit? 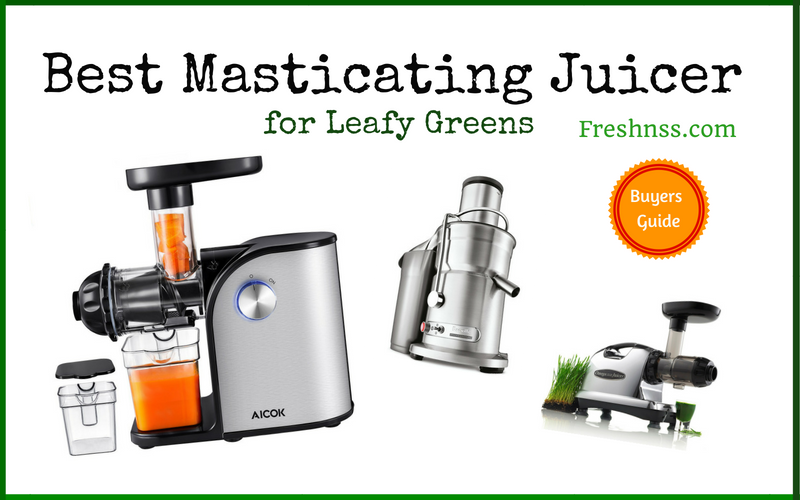 Let’s start our review by looking at, what is in our opinion, the best masticating juicer for leafy greens of 2019. This juicer from the Aicok brand is one of the most affordable options on the market when you consider its quality. The device is made from stainless steel, and it is equipped with a quiet motor to ensure noiseless operation. The Aicok Slow Masticating Juicer is made to provide you with the ability to produce cold-pressed juice from fresh leafy green vegetables. In turn, this slow-speed juicing operation will ensure that the antioxidants, minerals, vitamins, and fatty acids found in the vegetables are preserved for maximum health benefits. Separate juice and pulp containers come with this juicer, with the device being designed to split the pulp from the juice automatically. The lid also enables easy storage of the produced juice for maximum convenience. The best Omega masticating juicer for leafy greens is the Omega J8006 Nutrition Center, a complete solution that enables you to create delicious juices easily. This juicer is powerful and offers a juicing operation that is performed at just the right speed to avoid excessive heat from being produced, while still ensuring juice can be provided continuously for maximum convenience. This appliance operates at an 80 revs p/minute power rating and features a 150-Watt motor. The device also offers a way to produce cold-pressed leafy green vegetable juices – but is good for much more than just juices made from leafy green vegetables. It is made from high-quality stainless steel and features a metallic coating to ensure it will also easily fit into any modern kitchen layout and interior. If you are looking for the best Breville masticating juicer for leafy greens and any other kinds of juices, then this is surely the perfect option for you. Breville is known to provide some of the best quality kitchen appliances on the market today and, even though they may be somewhat more expensive than common household brands, their products come with unique quality features that ensure you get maximum value for the money you spend on their products. One particular feature of the Breville 800JEXL Juice Fountain Elite we found to be especially useful is the fact that it comes with two variable speed settings. This ensures you have maximum control over how slow (or fast) veggies and fruits are processed in the device and converted to high-quality, nutrient-rich juice. The last one of our highly recommended leafy green masticating juicers for 2019 is the SKG Wide Chute Anti-Oxidation Slow Masticating Juicer. This masticating juicer is relatively new on the market, yet it has a positive following behind its efficiency in producing top-quality juice for the juicer community. This juicer is on the more expensive price range, but the quality and features offered by this device surely make up for the price. The SKG Wide Chute Anti-Oxidation Slow Masticating Juicer features an AC Motor with a 240W power setting, operating at 60 revs p/minute. This provides a very slow operation to make sure the user is able to produce cold-pressed juice that has a maximum level of nutrients extracted from the vegetables. The four-inch opening at the top of the device allows for fruit and veggies to be easily added to the device for juicing. Now for the worst masticating juicer for leafy greens on the market, we highly recommend avoiding the QILEBI Portable USB Juicer Cup. This device seems perfect at first sight – what it offers perfectly fits with a modern-day life that is stressful and filled with so many assignments you never get the time to take care of your health. This one literally offers you the ability to make juice at your desk. It has a 480ML container that is filled with vegetables or fruit, and then the device is turned on, and it will juice the internal content. This is surely convenient, but the problem comes into play when you look at the speed of the device and the fact that no attachment is provided to capture pulp. The fact that the device’s blades operate at a very fast speed means a lot of heat will be produced and, in turn, this will cause a lot of the antioxidants and other nutritional content of the fruit and veggies to be lost. Leafy green vegetables have been linked to better heart health, a lower risk of Alzheimer’s disease and a stronger immune system. Knowing what to look for when buying a juicing appliance in order to benefit from the nutrients of those veggies can be very helpful and ensure you make the healthy choice. Once you know what to look for in the right masticating juicer to liquefy those leafy greens in your fridge, there are still some factors to consider. Power and speed, convenience, and of course, price. Power and Speed Settings: The main difference between a masticating juicer and other types of juicers on the market, some of which are explicitly for extracting juice from wheatgrass, is their power and speed settings. So to ensure that the juicer you are interested in will give you the results you are looking for, per the particular use you’re intending it for, you need to ensure that you buy a device with the right speed settings. For optimal results and to preserve as many nutrients as possible, a masticating juicer will work best because it will deliver at a very slow speed. Thus, if you come across a device that is labeled as a a masticating juicer, but throws around claims that it provides a fast way to blend juices on-the-go, then continue your search for a device with a slower rate to ensure that you can preserve more antioxidants and nutrients from your leafy green juices. Convenience Features: In addition to looking at the speed and the power settings of a device you are interested in, you should also consider the convenience features offered by the device. There are a variety of convenient features that are often provided by masticating juicers. Look for devices that are easy to take apart and clean, as well as devices that utilize safer materials to avoid chemicals from leaking into your health juices. Some of these juicers will also offer additional features, such as give you the ability to make your own butter, frozen desserts and more. It may be a good idea to also look for a device that will offer you a pulp-ejection compartment that will ensure you can continue juicing your leafy green vegetables without having to empty the pulp frequently manually. Price: The third particular factor that should also be considered important when deciding which masticating juicer to buy for your leafy green veggie juices is the price of the device. These devices vary greatly in price. While some masticating juicers can be picked up for less than $100, some options can cost you well over $500. For many people, it may seem that the more they spend, the better value they will get, and the more powerful the features will be. This is not always the case, however. It is important not only to consider your needs when shopping for a masticating juicer but also to take your budget into account – there will surely be a device that fits your particular requirements and your budget at the same time. There are many different options that you can choose from when you decide to start your journey to a healthier life through juicing. You are able to determine if you want a juicer that will give you a quick and easy, even portable way to create juices when you are on-the-go, or rather opt for a slower juicer. Understanding the difference between these different types of juicers is important. An electric juicer usually offers a very fast juicing speed. This means you will have the finished products quickly, offering you more convenience over a masticating juicer. While this may seem convenient, it is important to understand that the high speed of the blades cause heat and, in turn, this increase in temperature that occurs during the juicing of the leafy green veggies causes a loss of vital nutrients, phytonutrients, and other powerful antioxidants. A slower speed, yielded by a masticating juicer, generates less heat and preserves more of the natural health benefits offered by the leafy greens you want to make your juices with. Juicing has become an essential part of living a healthy life today. A busy schedule leaves little time for ensuring you maintain a healthy dose of these veggies daily, but with juicing, you can maintain a high intake of essential antioxidants and nutrients without spending hours in the kitchen. If you are ready to get started, then consider opting for the best masticating juicer for leafy greens of 2019.